Steel basement window well cover made of heavy duty steel. They should be installed in people traffic areas such as patios and walkways. All window wells should have a cover in areas where small children are playing such as backyards. Window wells can still fill with water even if they are capped with a clear plastic cover. The culprits are bad installations and negative grading. Window well covers are available in many sizes and shapes or can be custom made to fit any window well made of moulded plastic, poured concrete, corrugated steel or landscape timbers. Window wells without a cover need regular maintenance. It doesn't take long before blown in debris, leaves and children's toys clutter the window well. Without proper cleaning all this organic material will clog up the gravel inside the well and provides a fertile ground for weeds. During my many years as a building inspector I have seen weeds two feet and taller, growing in window wells, no kidding. Window wells in people traffic areas such as patios, walkways, backyards and play areas for small children should have a window well cover. The covers also will prevent pets and small wildlife (including frogs, mice, and baby rabbits) from falling in the window well. Window well covers that can be locked from the inside provide extra security. However, the locking device should be of the kind that does not require a key, tools or special knowledge to remove the window well cover from the inside in case of an emergency. A person trying to get out during an emergency may panic and fail to unlock the cover. In my opinion there should not be a lock on egress window well covers at all so emergency personnel can enter the basement or lower level faster. For more information go to Egress Window Wells and Egress Windows. Poured concrete egress window well. Casement egress window. 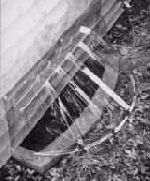 The main purpose of a window well cover is to keep debris and rain water out. Accumulated debris will prevent proper drainage to the weeping tiles which could result in water backing up in the window well and leaking into the basement. Replacing or adding a window well drain is expensive. Installing a clear plastic window well cover is by far the most economical way of keeping the window well (and basement!) dry. For more information go to Window Well Problems and Solutions. - Improved heat retention and climate control. - Clear plastic window well covers allow sunlight to enter the basement but cannot be used for ventilation. - Steel and aluminum grate window well covers will provide ventilation but block a lot of daylight. - Heavy duty steel or light weight aluminum grate covers: for small and large basement window wells. Ideal in areas with high foot traffic. Ventilation possible by opening basement window. Grate will block a lot of daylight from entering the basement. - Impact resistant clear plastic: Window well covers are virtually "unbreakable". They are strong and can support 300-400 lbs. depending on model and manufacturer. Unless reinforced, larger impact resistant plastic window well covers should not be used in areas with foot traffic. - Flimsy thin clear acrylic plastic covers: Warranted for up to five years. They will keep out wind blown debris and small animals but are not strong enough to break someone's fall. Not recommended in areas with foot traffic such as walkways, driveways, patios or play areas. Can be used for all other locations.